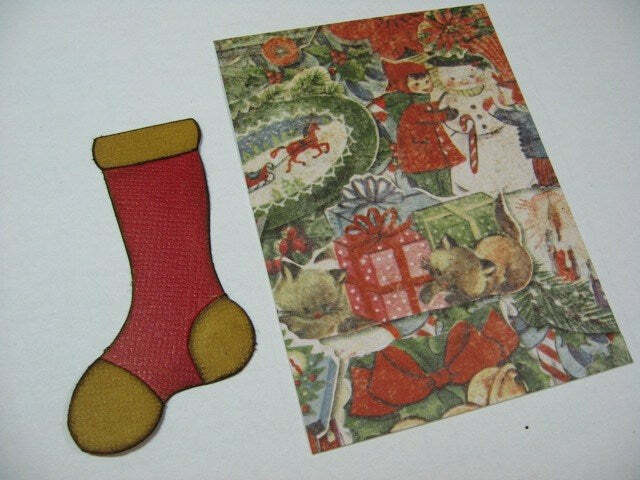 Step 1: Cut from Merriment paper stash: Red with polka dots – 4 3/4 x 4 1/2 inches. Music notes – 4 3/4 x 2 1/4 inches. 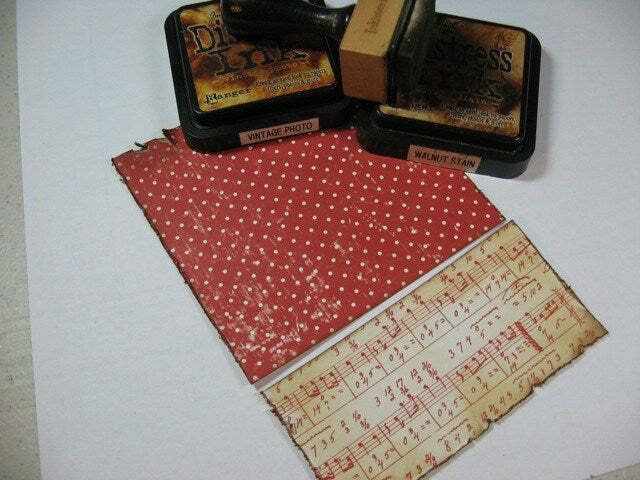 Distress edges then ink distress with Vintage Photo and Walnut Stain Distress Inks. Step 2: Die cut the Window and Window Box from dark brown Kraft Core cardstock and sand distress the tops and edges of each. 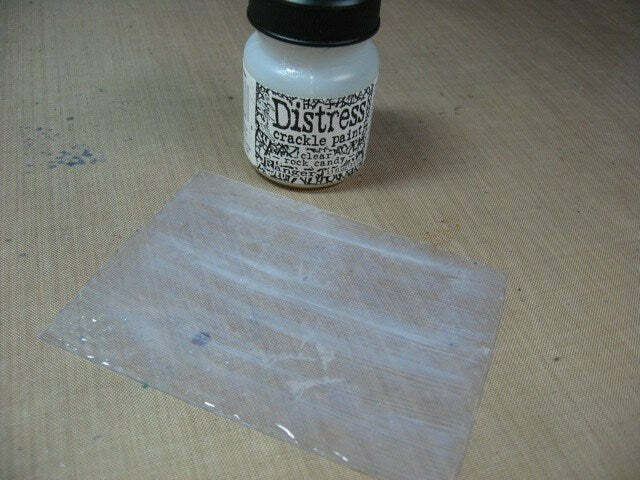 Step 3: Cut a piece of Ranger Clear Shrink Plastic 2 3/4 x 3 3/4 inches and spread an even layer of Ranger Glue N’ Seal on one side. Let dry completely. 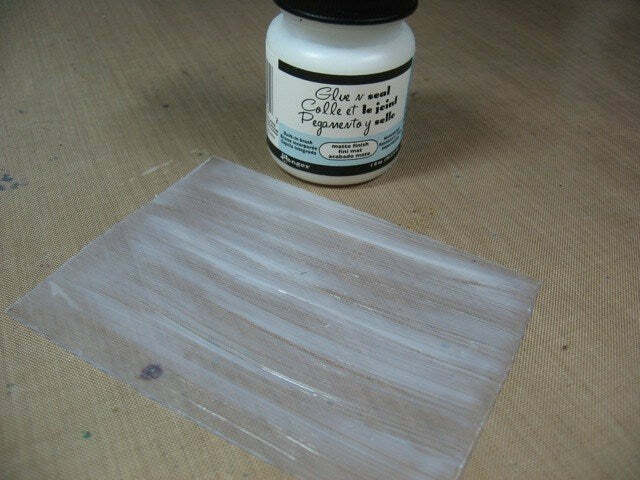 Step 4: Apply a medium thick layer of Clear Rock Candy Crackle Paint to the same side of the shrink plastic. Set aside to dry and crack.. 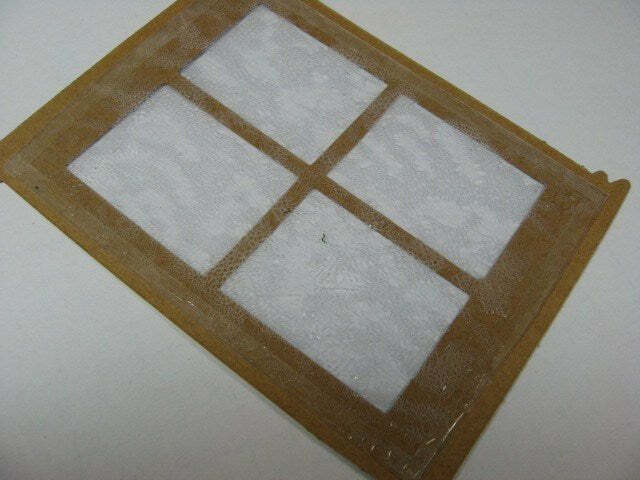 Step 5: Once the crackle has dried, adhere the piece to the back of the die-cut window. Step 6: This is how it should look from the front side. 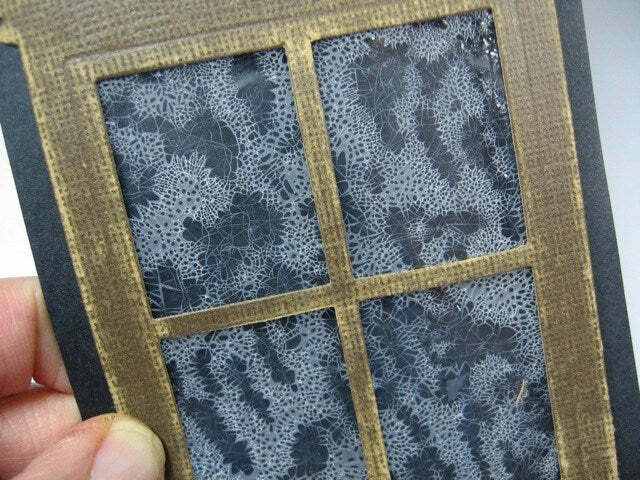 A faux frosty glass appearance. 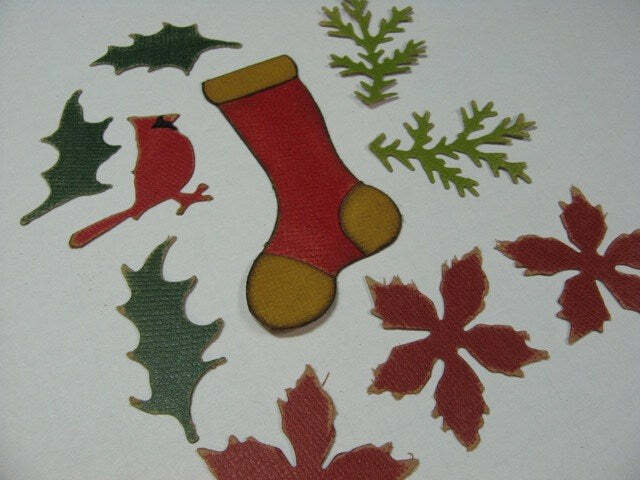 Step 7: Cut & assemble a mini stocking from gold and red Kraft Core cardstock inking edges with Walnut Stain Distress Ink. 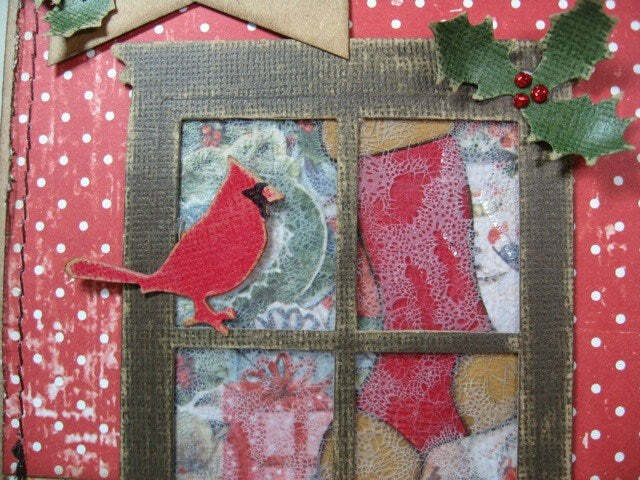 Cut a piece of Seasonal Paper Stash 2 3/4 x 3 3/4 inches for the inside of the window. 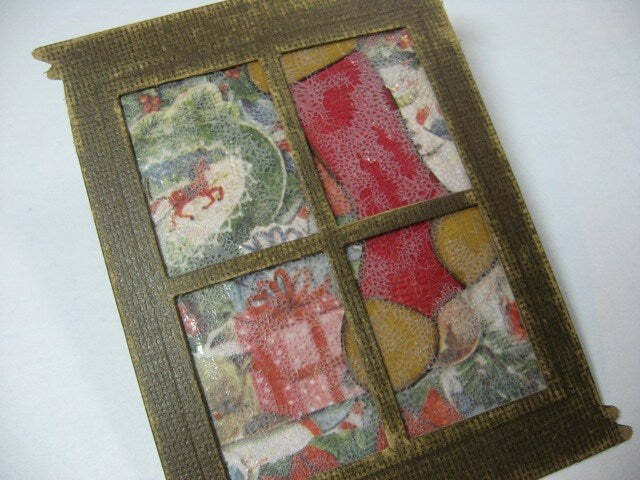 Step 8: Cut several other images from the Sizzix Alterations dies listed, sand and distress edges. 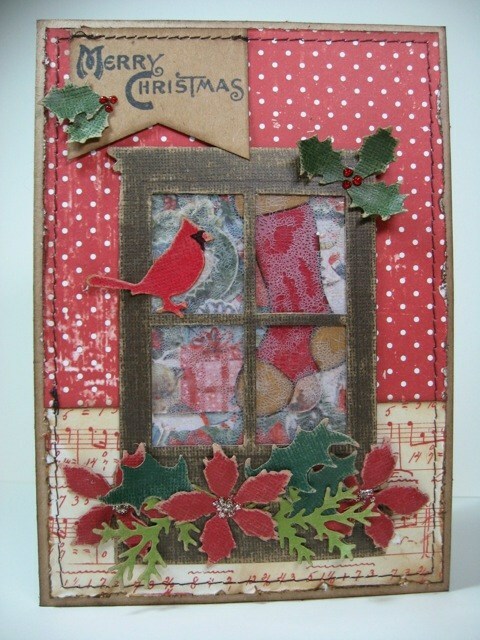 Step 9: Layer the Seasonal paper and stocking behind window opening as shown, adhering with Glossy Accents. 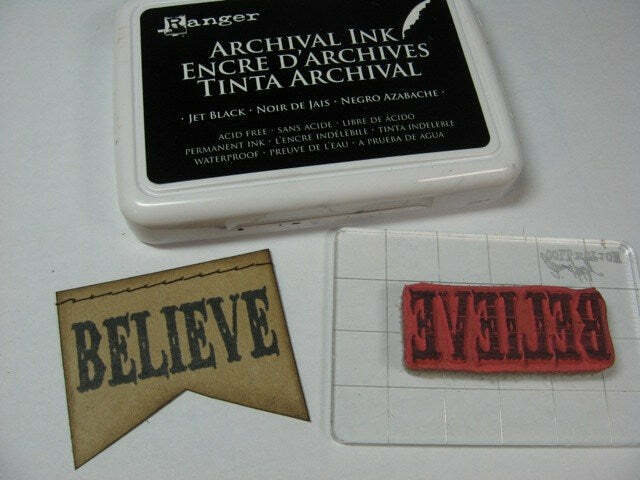 Step 10: Stamp BELIEVE with Jet Black Archival Ink onto Kraft cardstock. Stitch a line across the top with dark brown thread. Ink outer edges with Walnut Stain Distress Ink. Step 11: Assemble and stitch the two base papers for the card with dark brown thread as shown and adhere to a Kraft card base measuring 5 x 7 inches. 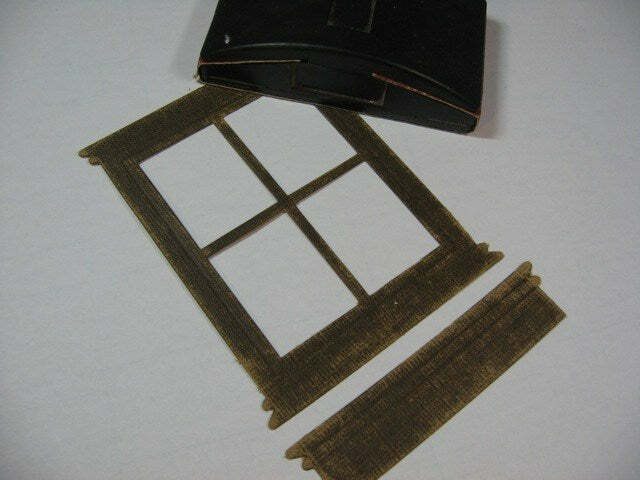 Assemble window, window box, and all other die-cut elements as shown. Step 12: Add Platinum Stickles to centers of poinsettias. 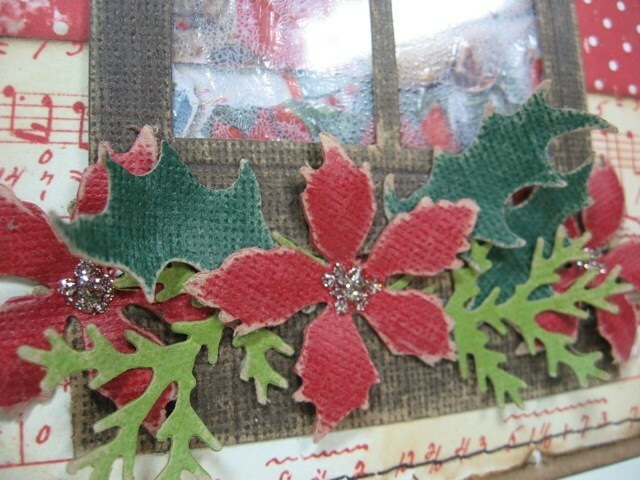 Step 13: Add Christmas Red Stickles near small holly leaves.